Pay band - Selected candidate will be posted on pay band INR Rs. 10,000/- (Post 1), Rs. 7100/- (Post 2).as directed by recruitment committee and as mentioned in Mangalore Refinery and Petrochemicals Limited notification. Selection Process - Selection will be done according to the direction of selection committee and based on the performance in the Written Exam. 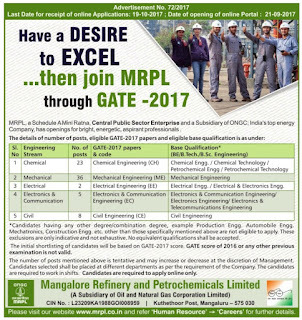 Educational Qualification - Interested Aspirant who want to take part in MRPL recruitment process must have Diploma / Engineering Degree Certificates/Degree or its equivalent Qualification from a recognized Board / University. Post wise qualification is mentioned in Qualification criteria section in notification. Important dates - Last date for Online Registration of Application : 07-10-2017. Selection Process - Selection will be done according to the direction of selection committee and based on the performance in the GATE-2017 score. 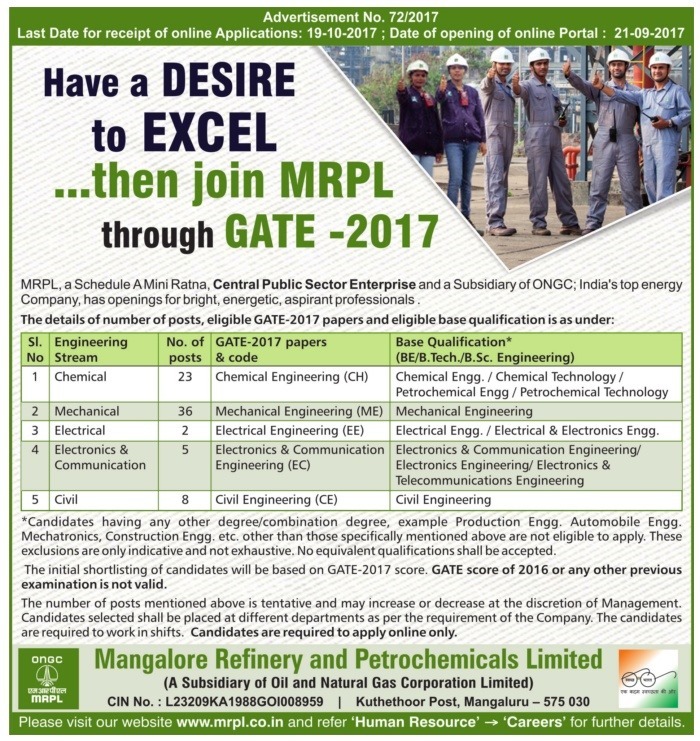 Educational Qualification - Interested Aspirant who want to take part in MRPL recruitment process must have Chemical Engineering / Chemical Technology / Petrochemical Engineering / Petrochemical Technology/ Mechanical Engineering / Civil Engineering Certificates/Degree or its equivalent Qualification from a recognized Board / University. Post wise qualification is mentioned in Qualification criteria section in notification.